Best Wall Mount Easel - A sturdy oak easel that was designed to be mounted on the wall. 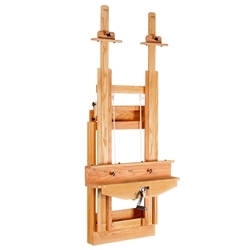 This easel can be used in the vertical position or tilted forward for pastelists or simply to reduce glare. Perfect for the studio with limited floor space. Will hold canvasses up to 88 inches high. Smooth, easy height adjustment. Extended easel height 102 inches, compact height 55 inches. Weighs 55 lbs, shipped partially assembled, too large for UPS, must ship by truck. The shipping cost of $39.95 applies to most areas located in the 48 contiguous states, remote destinations as well as Alaska and Hawaii require a separate quote.